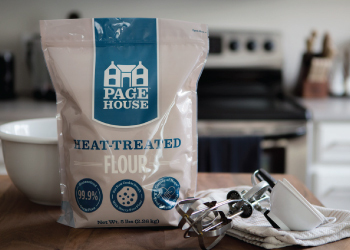 The best gluten-free flour option for a wide variety of recipes, including cakes, pastries, muffins, even pancakes. 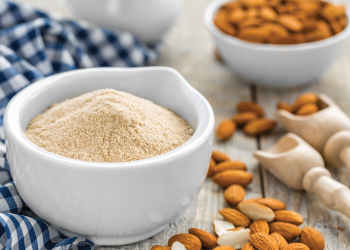 Honeyville's Natural Almond Flour is an amazing nut flour that fits all of your low-carb, gluten-free and paleo needs for a wheat flour replacement. Made from California almonds with no additives or fillers, it’s milled to a very fine consistency that produces fantastic results for your baked goods. Whether you’re intolerant to gluten or want to follow the paleo diet, our almond meal is great for both. It’s also widely known to be the best in taste, texture and consistency, no wonder all of the bakers and chefs use it. Any gluten-free recipe is possible with this nut flour, including breads, cakes, cookies, pastries, pancakes, macaroons and more! For a lighter flour that has the almond skins removed, try Honeyville Blanched Almond Flour. Whether you use our blanched or natural almond flour, you and your family will love it for its subtle nutty flavor and how it turns any gluten-free recipe into a new family favorite. Shelf-Life: Stores for 6 to 9 months in a sealed 5 pound bag as well as a 25 pound bag under ideal storage conditions (cool, dry place). Almond flour may also be refrigerated or frozen for storage purposes. Uses: Substitute with any recipe calling for flour to make healthy gluten-free baked goods and more. Visit our blog In the Kitchen with Honeyville to find delicious recipes for Natural Almond Flour and more! Packaging: Natural Almond Flour in bulk is available in a 5 pound bag and a 25 pound bag. The 25 pound bag of almond flour is a commercial package that is not sealed. It comes in the industry standard food-grade bag that is folded over in a heavy box for shipment. Almond flour contains natural oils, and in a 25 pound bag, the flour isn't sealed in order to stop moisture from building and making the flour go rancid. Packaging may vary.